Most Kickstarter projects come through in the end, but every now and again, something fails in spectacular fashion and reminds us that crowdfunding is not all it’s cracked up to be. 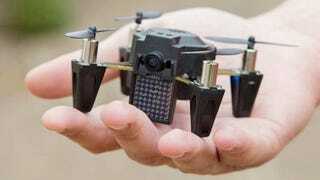 Back in January, the Torquing Group raised $3.4 million for a handheld drone called the Zano. For around $250, you’d get an “ultra-portable, personal aerial photography and HD video capture platform, small enough to fit in the palm of your hand and intelligent enough to fly all by itself!”. Basically, it was meant to be a small, easy-to-fly drone that you talk to with a smartphone. I got the first demonstration of the drone and it was not impressive, staying airborne for only a few minutes, colliding with walls, and delivering very poor video. Around 600 drones were shipped out to backers, but failed to function as promised. Far from taking selfies or following mountain-bikers, the drone would barely even fly. Having explored all options known to us, and after seeking professional advice, we have made the difficult decision to pursue a creditors’ voluntary liquidation. All creditors will be contacted by an insolvency practitioner next week. We are greatly disappointed with the outcome of the Zano project and we would like to take this opportunity to thank everyone who has supported us during this difficult period, especially our loyal employees whose commitment has exceeded all expectations. The chance of backers getting their money back is slim. As investors, rather than creditors, they’ll be right at the bottom of the list for getting their money back—assuming there’s much left. It’s a sad moment for the company: Zano promised pretty amazing things, and it’s a loss for everyone that they didn’t pan out. But it’s also a good reminder that Kickstarter, for all its successful products, is still asking you to give money to unproven startups. No matter how big the project, people can still get burned.